Picking up leaves with a lawn mower can be a hassle if you have a big yard and lots of leaves. You need to do it pretty much every day if you want to keep up otherwise there are too many leaves on the ground, they clog up your bagger tube and fill up the bags too quickly. The new and improved way is making a giant bag out of two 6 by 8 feet tarps attached to the lawn mower. Now one person can pick up leaves and complete a larger area before emptying the bag. What you use will depend on your lawn mower and what you already have around. 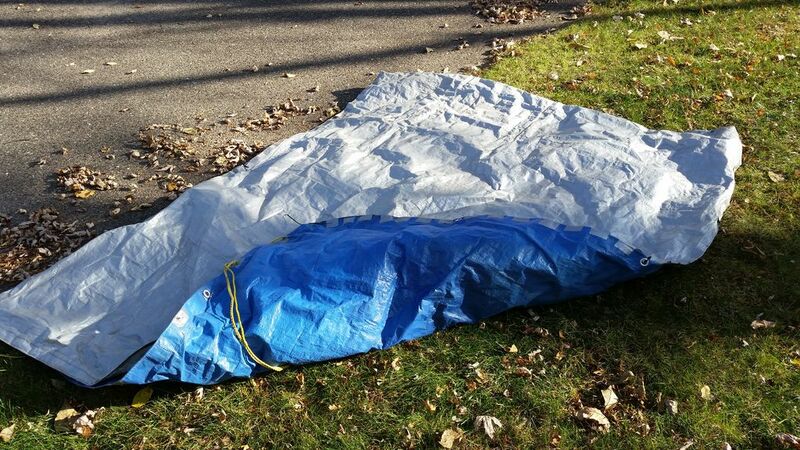 Start by placing one tarp on top of the other. Use zip ties to connect the tarps through their grommets. Then use duct tape to tape the 3 sides, leaving about an inch between the pieces of tape to allow air through. Be sure to only connect the corners and 3 sides, you are making a giant bag or pillow case, 3 sides are sealed and one is left open. Now you need to have something to attach the bag to the lawn mower. We left the rack for the regular bags on the lawn mower, extended it and added a support for the tube with conduit and a piece of wood. We zip tied a piece of conduit to the existing rack for the bags. Then used a block of wood and some 90 degree pieces of conduit to support the tube. The wood is attached to the conduit with screws. The open side of the bag is attached at one corner to the tube with a bungee cord. Then it is closed and secured to the conduit support with rope. The rope is threaded through the grommets in the tarps and wrapped around the conduit. Extra holes were added along the tarps with duct tape reinforcement. Step 5: Ready to Use! Your leaf bag is now ready to use! If you're going through lots of leaves, raise the mower deck up and go slowly. When it is time to empty, just remove the bag and empty it, Then reattach and do it all over again. Please vote for this instructable in the Winterize contest! Thank you! for the side which attached to the mower side, I used 2" wide velcro tape that tapered down to the hole for the mower spout, just made it easier when opening when emptying. I had to put new blades on my deck but I finally got it to work. Even the soggy wet leaves left from last fall that I didn't get to. This is the most awesome idea I've seen on here yet! Really amazing, you are great!!! Instead of this bag, why don't u try a mesh type of bag which can keep the leaves inside the mesh bag. In that way , the bag will be free of air space inside. Please note that you can still use these mulched leaves in the compost pile, they aren't necessarily hauled away. you can even dump them and much them again to make the composting quicker. I own a expensive leaf collector system and it is just sitting in my backyard because the engine on the blower has carburation problems. This eleminates that concern. I love this idea and plan to make it soon to avoid manually raking my backyard :) Great job! 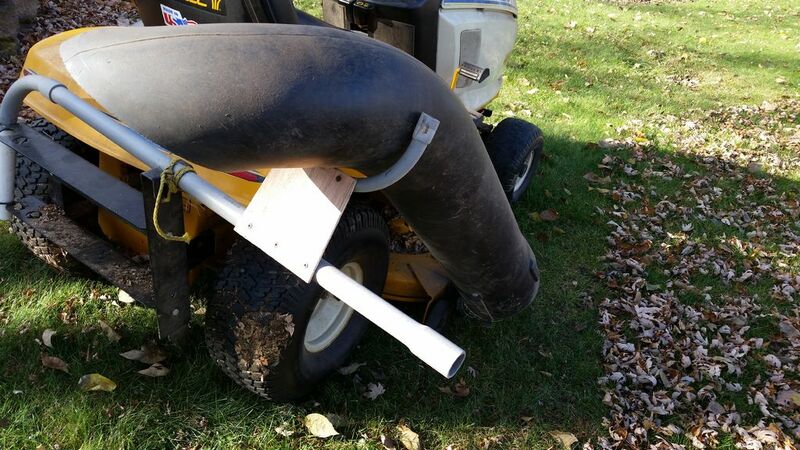 how or where do I get the pipe that goes from the mower deck to the bag? It's the one that came with the lawn mower. So if you don't have one you'd probably have to order one for your specific mower. Brilliant! My only suggestion is try using Gorilla tape instead of the grey stuff. It'll last longer and can re-use the bag next year.